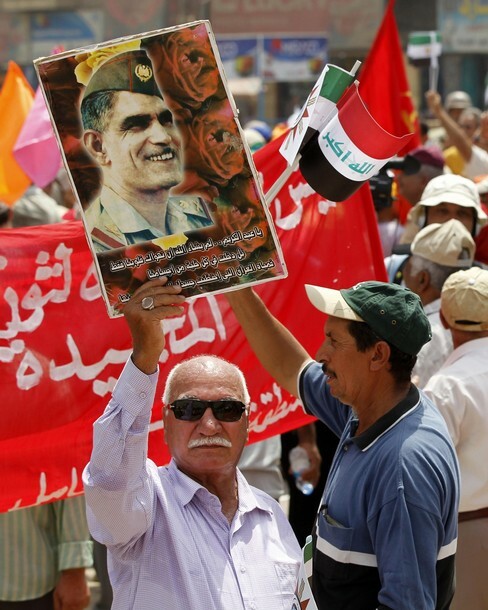 A person holds up a graphic of Abd al-Karim Qasim, a nationalist Iraqi Military general who overthrew the actual monarchy and also seized power in a 1958 coup d’etat, throughout a celebration to mark the actual revolution’s anniversary at Tahrir sq . in central Baghdad July 14, 2011. Qasim ruled the nation as Prime Minister of Iraq until his downfall and death in 1963.
from 1958 to 1963 it was the gold time and best time ever in iraqis modern history. Abd al-Karim Qasim revolution 1958 in remembrance .